From its first pitch, baseball has reflected national values and promoted the idea of what it means to be American. Beloved narratives tied the national pastime to beliefs as fundamental to our civic life as racial equality, patriotism, heroism, and virtuous capitalism. Mitchell Nathanson calls foul. Rejecting the myths and much-told tales, he examines how power is as much a part of baseball--and America--as pine tar and eye black. Indeed, the struggles for power within the game paralleled those that defined our nation. Nathanson follows the new Americans who sought club ownership to promote their social status in the increasingly closed caste system of nineteenth-century America. He shows how the rise and public rebuke of the Players Association reflects the collective spirit of working and middle-class America in the mid-twentieth century and the countervailing forces that sought to beat back the emerging movement. He lays bare the debilitating effects of a harsh double standard that required African American players to possess an unimpeachable character merely to take the field--a standard no white player had to meet. Told with passion and righteous outrage, A People's History of Baseball offers an incisive alternative history of America's much-loved--if misunderstood--national pastime. Mitchell Nathanson is a professor of legal writing at Villanova University School of Law and the author of "The Fall of the 1977 Phillies: How a Baseball Team's Collapse Sank a City's Spirit." 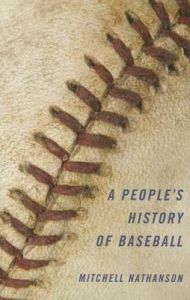 "A People s History of Baseball" provides vigorous and fascinating challenges to the ways in which fans have related to a game that [Nathanson] says has been virtually synonymous with America for well over a century. --"The Boston Globe"Nathanson has researched thoroughly, writes persuasively, and does not shy away from challenging even the most revered narrative in baseball: Branch Rickey, Jackie Robinson, and the integration of Major League Baseball." --"Journal of Sport History"